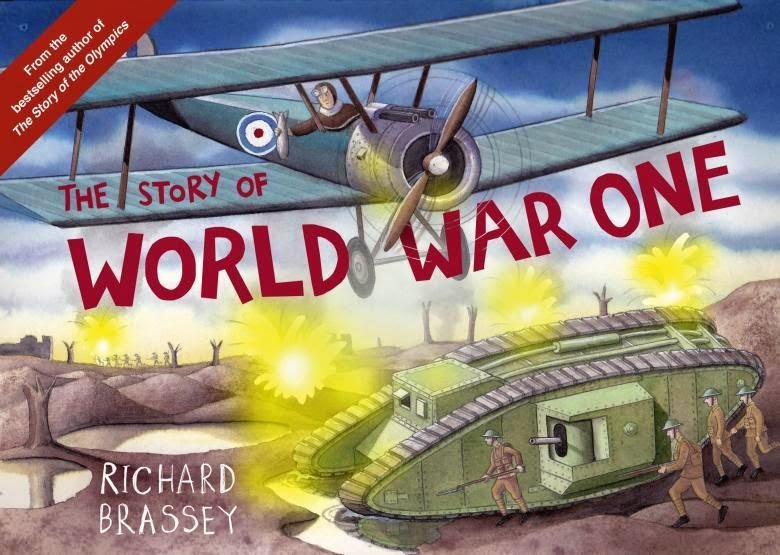 Richard Brassey's explanation of World War I is an entertaining and informative picture book children will find captivating. The heartbreak of slaughter has been omitted in his colourful and precise illustrations but there is plenty of action and insight to glean. He uses topics throughout the book, e.g., The Home Front and the Role of Women, and Weapons and War Machines, and the text is supported by maps and cartoon-style strips together with fact boxes. I found the Trench Warfare double spread showing a section of trench layout and why it was constructed that way absolutely fascinating. Information about trench foot, shellshock and even the trench coat which later became a popular item of clothing were among the other interesting snippets included in this section. There is a naivety in Brassey's drawings which reflects the innocence of the times. Never again in war would opposite sides down tools to play footie together in no-man's land on Christmas Day as they did in 1914. The text gives a concise, easy to understand explanation of the events leading up to, during, and the ending of the Great War, and reflects the courage, resilience and decisions, often unwise, of those involved. His side facts which include why the poppy is worn on Remembrance Day give a wonderful balance to the more sobering events. The prediction that only one in ten English girls would marry because of so many young men being killed thankfully did not become a reality. The Story of World War One is a timely release to co-incide with the centenary of the opening year of the event. My impression is that children will have a much better grasp on this period in history, and appreciate the significance and sacrifice of those who fought for freedom because of the skill and creative talent of the author.